Questions on geometric optics were discussed on many occasions on this site. Try a search for ‘geometric optics’ using the search box provided on the side bar this page or click on the label ‘geometric optics’ below this post, to access all posts related to geometric optics. (1) Focal power or optical power (or simply, power) of a lens is the reciprocal of its focal length. The focal length has to be expressed in metre for obtaining the power in its popular unit, dioptre. If the focal length of the combination of the lenses is F metre, the power of the combination is 1/F. 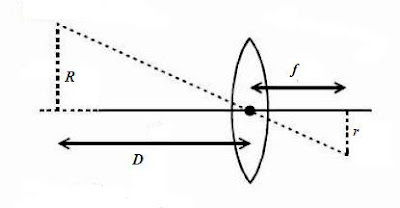 (2) A bright object O is placed on the principal axis of a thin converging lens. The lens produces a real magnified image of O at the position I (Fig.) at a distance of 44 cm from the lens. 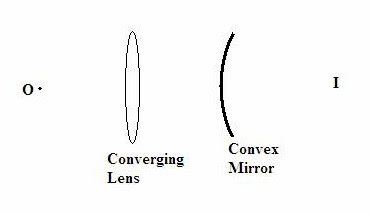 When a convex mirror of focal length 12 cm is interposed between the image and the lens as shown in the figure, a real image of the same size as the object is obtained side by side with the object. What is the distance between the lens and the mirror? Since the final image is obtained side by side with the object, the rays of light must fall normally on the mirror. This means that the initial image I must be formed at the centre of curvature of the mirror. The radius of curvature of the mirror is twice its focal length and is therefore equal to 24 cm. The initial image I must therefore be at a distance of 24 cm from the mirror. Since the distance between the lens and the initial image I is 44 cm, the distance between the lens and the mirror must be (44 – 24) cm = 20 cm. You may try drawing a ray diagram to locate the image, as shown in the adjoining figure. A ray of light proceeding towards the centre of curvature C of the mirror gets reflected from the mirror and retraces its path. Another ray proceeding parallel to the principal axis gets reflected from the mirror and proceeds as shown, as though it diverges away from the focus F of the mirror. 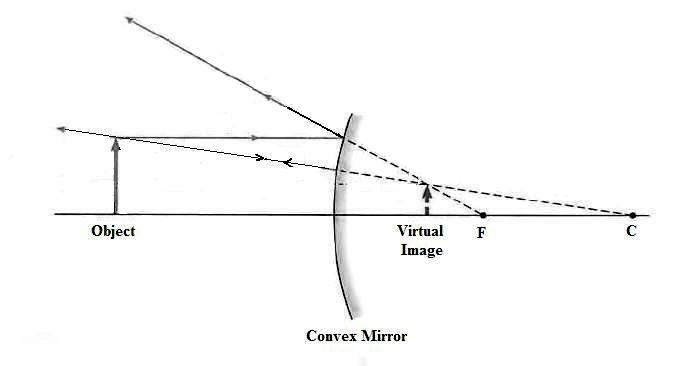 The image is virtual and is located behind the mirror at distance less than f.
[Note that the image will be located behind the mirror at distance less than f for all object distances]. Since the sun is far away from the lens, a real diminished image of the sun is formed at the focus of the lens. [The student has to keep the sheet of paper at the focal plane of the lens for burning it]. The formation of the image is shown in the adjoining figure in which the radius of the image is shown as r.